It was just eight years ago that the IceCube detector, a research center located at the South Pole to detect neutrinos emanating from the cosmos, was commissioned. Three years later, it began to register the first momentous results. The detection of high-energy neutrinos by IceCube made viable completely new options for explaining how our universe works. "These neutrinos with their considerable energy are cosmic messengers we have never encountered before and it is extremely important that we understand exactly what they are telling us," explained Dr. Ranjan Laha of Johannes Gutenberg University Mainz (JGU). Working in collaboration with a colleague at Stanford University in the USA, the Mainz-based physicist has put forward a new hypothesis on what this interstellar message carrier might be. The two physicists have calculated that what has been detected could be the track of a high-energy tau particle that transited the IceCube detector. Neutrinos are particles that have only very little or no mass, enabling them to pass through material almost unnoticed and making them extremely difficult to detect. But for this very same reason, these elusive particles are particularly important to science because they originate from exploding stars and other high-energy astrophysical phenomena in the furthest depths of space from where they travel to Earth practically unimpeded, giving us insight into what is happening out there. In the case of the IceCube Neutrino Observatory, the individual detector elements are buried in the Antarctic ice and distributed across an ice volume of a cubic kilometer, where they are well shielded against the effects of possible interference factors. The project team reported the detection of high-energy neutrinos from space for the first time in 2013. Numerous related events have been registered since then. The IceCube team responsible for the scientific program consists of 300 physicists from 49 institutions based in 12 countries and includes researchers from JGU. Matthew Kistler of Stanford and Ranjan Laha of Mainz University have analyzed the various events, their objective being to attempt to explain a particular enigma: In June 2014, the IceCube sensors detected a particle with extraordinarily high energy. Calculations showed that the particle deposited 2.6 petaelectron-volts (PeV), in other words, 2.6 quadrillion electron-volts. By way of comparison, collisions between protons in the Large Hadron Collider (LHC) at CERN, the world’s largest particle accelerator, occur at an energy of just 13 trillion electron-volts. "The track registered in June 2014 throws up all sorts of questions," said Laha, pointing out that this is the maximum high-energy event recorded to date. "The foremost questions is what sort of neutrino would leave behind a track like this." There are three types of neutrino: electrons, muons, and tau neutrinos. Looking for an answer, the two physicists first based their investigations on the standard assumption that the track had been produced by a muon. Following collision with an atom nucleus, a muon neutrino would have been transformed into a muon and thus would have been captured by the optical sensors of the IceCube detector. "However, we have demonstrated that this hypothesis is constrained," explained Laha. Instead, the two researchers propose a completely new and unconventional interpretation of the event: the track could be that of a high-energy tau lepton. To be registered by the detector with an energy of 2.6 PeV, the supposed tau neutrino would have to have had an initial energy of at least 50 PeV. "A tau particle that can pass through a detector with a length of one kilometer without decaying and furthermore releasing energy of 2.6 PeV must originate from a neutrino with significantly greater energy," added Laha. "Assuming this is the case, this opens up completely unexpected possibilities, namely that astrophysics should start looking for neutrinos with energy of up to 100 PeV." The two researchers also came to the conclusion that the 2.6 PeV event was probably caused by a component of the neutrino spectrum previously unknown to astrophysicists. A certain continuity is usually to be expected when it comes to the events recorded by IceCube. However, the gap between the stated event with the highest energy captured to date and the other registered data is unusually large. "We still don't really know what caused the 2.6 PeV track. It is generally assumed to be a transiting muon. We show that it is also possible to be a transiting tau particle," concluded Laha. "We consider this event so significant that we believe it should be examined more closely. And we need more data to be able to discover more and decode this message sent us by the cosmos." Ranjan Laha is a postdoctoral researcher and a member of the work group of Professor Joachim Kopp, Professor of Theoretical Particle Physics at the Mainz-based Precision Physics, Fundamental Interactions and Structure of Matter (PRISMA) Cluster of Excellence. This figure shows various neutrino fluxes as a function of neutrino energy. The neutrino energy is expressed in GeV (1 GeV = 1 billion eV). 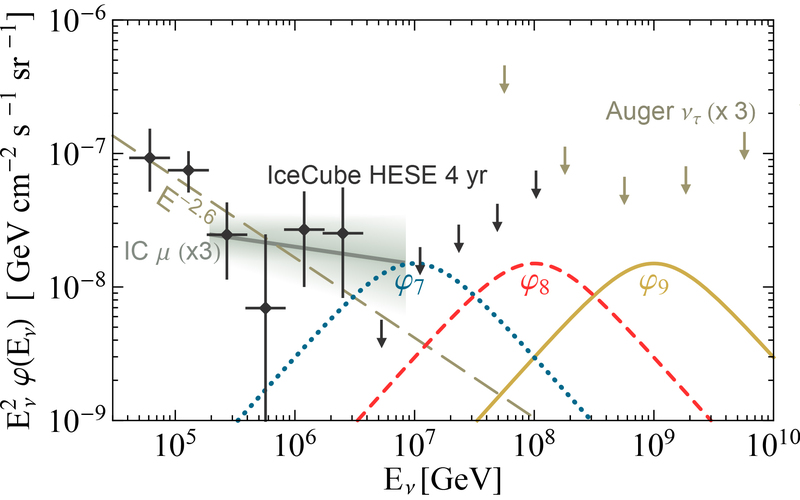 IceCube data points and upper limits of astrophysical neutrino fluxes from other experiments are also shown here. Spectrum of upgoing taus as a function of the energy of tau as it enters IceCube. The vertical band represents the energy of the tau particle necessary to deposit 2.6 PeV inside IceCube.